You've probably heard of umbilical cord blood banking. Many families have decided to save their child's cord blood stem cells for future needs. 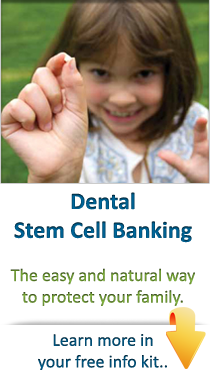 Did you know that stem cells can be collected from teeth? If you or a family member are losing baby teeth or having any teeth surgically removed, I invite you to learn more about the benefits of Store-A-Tooth. "Dental Stem Cells and Type 1 Diabetes"
© Copyright Provia Laboratories 2014. All Rights Reserved.